Home Again: Her Legacy Lives On! "What would drive people to town this early in these snowy hazardous conditions?" Then two elderly women caught my attention. I observed them from where I sat, as they were in the checkout counter and they looked so happy. They walked passed me and I said, "Looks like you are enjoying the snow and each others company." Well it didn't take long and they let me know that they were both sisters and had lived next door to each other for over 60 years. I asked them what was the key to keeping their relationship? One promptly responded, and said, "Always mind your own business." That's quite simple. They were heading off to McDonalds to catch their free coffee. Somehow our conversation continued....we introduced ourselves to each other, Velma and Ellen. I was not in any particular rush today, and so we just chatted it up and before we knew it, we started recognizing many familiar families in town. Yes, they knew Eryn..and Collin...and there lovely family of three. These women were the great aunts of this young family. Yes, they remembered Mikki, which was Eryn's best friend in high school. What a small world. We smiled, enjoyed each others company, and finally they shuffled along their way to McDonalds. What prompted me to share this today? I think when I sat at Starbucks gazing, I realized that these two women reminded me of my own mother, and I was sort of trying to imagine her shopping for groceries for her family, and being and happy and content. On Saturday, Nov. 27th, 2010 another milestone is marked. Ten years ago she slipped away from us, leaving us feel robbed, just a bit too early. But nevertheless her legacy lives on forever. She has taught me so much and I realize how much she sacrificed to be a mother and wife. This past year, I've taken the time to read her familiar devotional book called, 'Be Still and Know,' by Millie Stamm. I love to feel it's pages and observe all the underlinings and highlighting and contemplate what she was thinking as she scribbled notes into the margins. I too, have started to add sticky notes to her pages. She and I have continued the journey together. Only mothers and daughters can truly understand this special bond. This Monday, I'll be having a special luncheon with a long time friend whom I have not seen for over 35 years. What makes this luncheon special, is that her mother and my mother were close friends also and her mother will be hosting the luncheon while we have a reunion. I am feeling so honored and thankful for this opportunity to meet with other women of kindred spirits. So Mom, I am meeting your special friend, and I will throw my arms around her and her daughter, both, feeling the warm presence that you so often gave to others. May your legacy continue to live in my heart forever. Good morning Marg - this post put a lump into my throat. The lovely connection you maintain through your mum's book of devotions and your anticipation of seeing your mum's friend and yours. I hope you have a lovely visit! Oh Marg this post is heartwarming:) Love the legacy left to you and now you are passing that on. I'm chuckling..those ladies sure were chatty for 'always minding their own business'. What a beautiful tribute to your mom! I still keep wishing my sister and I would be able to do what those two ladies were doing - but alas, we live in different provinces and only get together once or twice a year! Your post just warmed my heart! How fun to connect with the two old gals who were 'minding their own business'...and find friends and family in common! Wishing you a wonderful time on Monday...as you connect with your friend from the past...and your mom's friend as well. 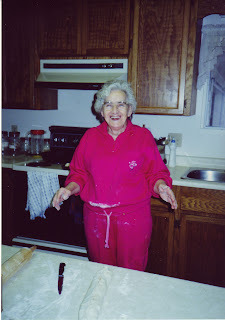 Hugs to you tomorrow...as you mark ten years of missing your mom! I don't think I've ever commented on your blog before, although I do occassionally check it out. The picture of your mom today, though, reminded me of my mom, since they too were friends. My mom, Anne Boschman, has been gone now for 24 years, and we also felt it was much too soon to have to let her go. I was 33 years old when she died; this year my daughter turned 33. Kind of makes me reflect on my own life. I smiled at the caption under the picture " she's in her glory". Now, they are both "in glory"
Blessings to you as you remember your mom in a special way! What a beautiful post Marg! How wonderful that you had eyes open to see and time to converse with these dear older ladies. Blessings on the luncheon. What a wonderful meeting you had....at the perfect time. I remember your mom today too....Mrs. Schmidt who turned around in church every Sunday morning to greet us. My arms of .love are around you this morning Marg. It is good to take time to remember those who left us such a great legacy. Your mom's devotional book is such a treasure. Thanks for sharing your heart today. This little visit here has brought a tear or two to me ... I remember you mom .. and Mrs Boshmann .. these beautiful women ... so inspiring. I can only imagine how you miss your mom. May you continually be blessed by her memory. What a great day to look forward too! You will recognize a little bit of your mother's influence in her good friend (and vice verse). Enjoy the moment. Your Mom was a wonderful lady. . . . with an unselfish and giving heart. She inspired me to be a better person. I was her "Heart 2 Heart" prayer partner many years ago in Central Heights and treasure the devotional book she gave me. My thoughts are with you today. I loved your 'new' friends. You never know what blessing is waiting for you to take notice! I'm sure they were as blessed as you were ! How special to have a reunion with a friend whose mother was your mother's friend! Your post tugged at my heart! This was so beautiful and touching to read, Marga. Your Mom looks like she was a very lovely woman. I still have my Mom, but she is becoming frail, so I try to appreciate each day she is still with us. Enjoy your visit with friends tomorrow! Marg, I must admit to having tears in my eyes. I am so glad you have loving memories of your mother to treasure. I still am blessed to have my mother. I am an only child, and so many of my memories are shared only by her. What a tender post about your mom. I've been impressed with your mom since you told the story of her passing along the "baton". She was obviously a very special person. How lovely for you to share her thoughts through the reading of her devotional. Such a sweet post Marg - it's been 19 years since my mom died and I miss her often. Hope you have a wonderful reunion with your friend and your mom's friend. I'm sure there will be sharing of many happy memories! What a wonderful blessing in life to have a mother who loved and still loves, you so. I am very close to my own mother who is still living. Your post reminded me of the treasure I have...and it takes my breath away to think of living life without her. She is strong in the Lord. So I will be strong (for her) when she is gone. She would want me to be. It's so nice that you have her devotional book. So meaningful, and encouraging to you. I loved the post. Thank you for sharing your heart. This was a beautiful post. I wish my Mom lived closer, my daughter too. I was very happy to read that you take the time to chat with strangers. People don't seem to have time or inclination to do that anymore.